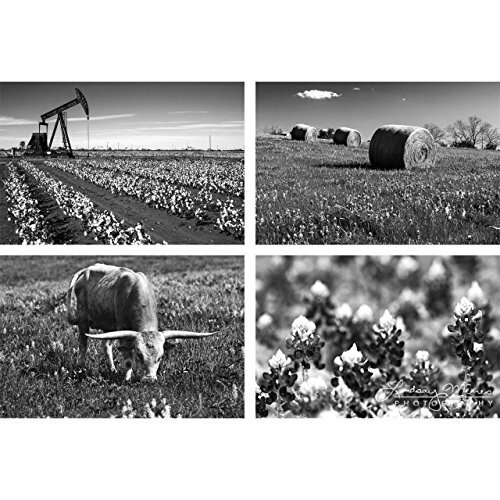 A four print set of complementary Texas prints in black and white. This Texas wall art set features a pump jack in a cotton field, hay bales, bluebonnets and a longhorn. This 11x14 inch B&W photo set is printed on Fuji Pearl paper, which features a metallic, pearl-like appearance and a glossy finish. This listing is for the four (4) 11x14 inch photo prints displayed above only. Search "Black and White Texas by TravLin" to see other Prime variations and customizations of this item.